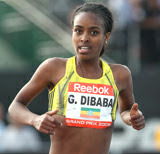 Genzebe Dibaba, younger sister of Tirunesh & Ejigayehu, shined at the Shanghai Golden Grand Prix when she won the women’s 1,500m race here today in 3:57.77, an Ethiopian record and more than eight seconds quicker than the previous fastest time in the world this year. Equally amazing was the performance of Hagos Gebrehiwet of Ethiopia, who won the men’s 5,000m in 13:11.00, the fastest in the world this year. Gebrehiwet celebrated his 18th birthday just a week ago, Meanwhile, Kenenisa Bekele, the Olympic champion over 5,000 and 10,000 meters could only finish a disappointing fifth.